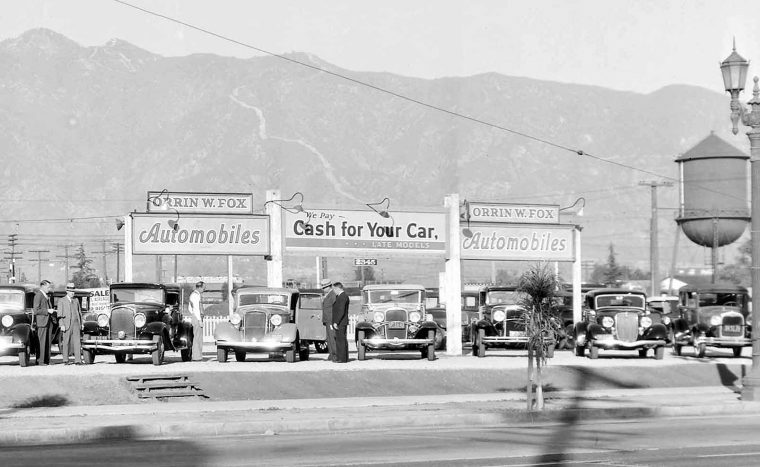 Orrin W. Fox’s used car lot was located at 2345 East Colorado Boulevard in Pasadena, California, when this promotional photo for Fox, dated by the source was taken in 1933. At that time due to the Great Depression, it was a buyers market, and Fox’s signage reflects that situation. The newest cars in the front row are a pair of 1933 Fords, and the oldest is an early Model “A” Ford Tudor. Perhaps the most unique car in the line up is a semi-customized late Model “A” Roadster with aftermarket smaller diameter wire wheels with lock rings, an unusual spoke arrangement, and fitted with odd looking hubcaps. In addition, the windshield is raked further back than original, it is fully accessorized and has added pin-striping and bright metal trim strips on the rear fenders. Share with us what you find of interest in this photo courtesy of the Pasadena Public Library. This entry was posted in Auto photos 1921 - 1942, Garages and Dealerships and tagged 1930s Cars, 1933 Fords, Model "A" Fords, Pasadena California. First thought on that decked out A is repossession — blew the rent money on fancy tires. Orin W. Fox later became an AMC dealer located on the South side of Colorado Blvd. at Madre. That location is now a Buick dealership. In the lead photograph, 2nd car from the right, looks like a 1933 FORD V8. In the 2nd picture, 3rd from the left looks like another ’33 FORD V8. The unusual car is the 1931 Hudson, on the left in the lower photo. That years’ regular line Hudson was the Model T. There is a ’33 Dodge on the Hudson’s left. the rest of the cars are Fords and Chevies – at least they are in the front row. Theres a great chapter from the book”The grapes of wrath” by John Steinbeck which takes place at a used car lot during the Depression.Its told from the point of view of a cheap,chiseling car salesman and how he describes going about cheating and tricking the poor ignorant Okies and hicks who know little about cars but need one to get to California. Route 66 must have been littered with broken down cars and destroyed families back then.A trail of tears. The car under the “cash for your car” sign appears to be a ’31 Oldsmobile roadster with optional dual side mounts. A bit OT here, but maybe this enquiry might jog a memory or two. I am currently researching a former Milnes-Damler omnibus of 1905 – with the British registration number D1959 – which had been restored in the mid 1970s and was a regular entrant in the Commercial Vehicle London to Brighton Run in England. During the mid 1980s, I understand that the bus was acquired by the late Mr James C Leake for exhibition in the Antiques Inc. Collection in Muskogee. Just wondered if anyone on the Old Motor team or any of your correspondents might be able to confirm whether or not this vehicle is still in the Leake family collection or at another museum in Oklahoma or elsewhere in the USA? Any information that you are able to provide would be gratefully received. My research is concerned with producing a potential story on this vehicle. After my previous complaints about never seeing a Hudson, 2 come along in a couple of days ! I own the only surviving ’34 Hudson 8 LTS Victoria in Europe – and probably anywhere – so I do get kinda lonely ! I love the men in suits and hats in these old photos. Casual apparel must have been totally unknown in those days. In the background, is that the “road” to Mount Wilson observatory? The “road” is an especially wide fire break. I grew up just south of Pasadena with that and others constantly in view (when not too smoggy) and a reminder that wild fire had been problem for decades. My dad sold GMC trucks at Fox’s Five Acres from 1955 to 1980. I have Fox’s Pasadena license plate frame on my ‘67 Buick. 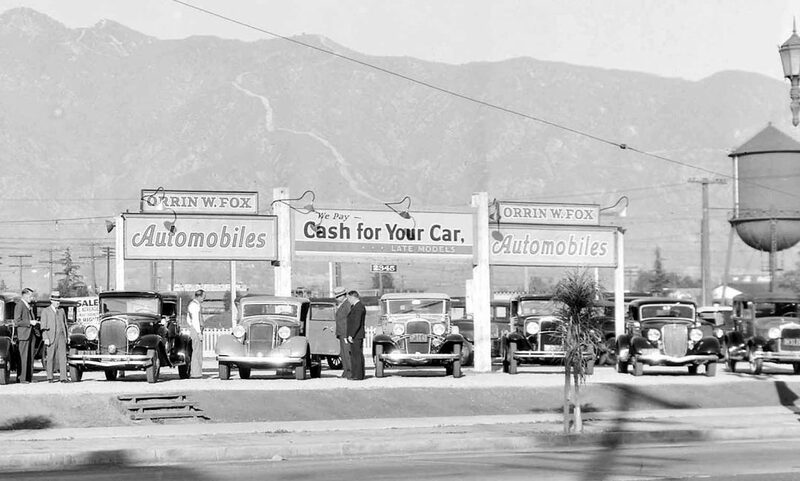 Note : The Orrin Fox Used Car Lot, sign, (with 2 roses) on Colorado Blvd, in the Pasadena area pays homage to the Annual “Rose Parade”, on New Year’s Day. 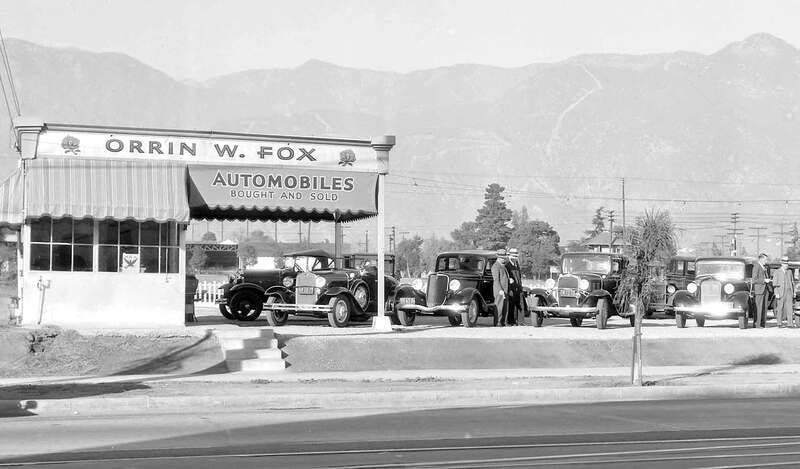 The men in the picture are “posed”, to show: “Prosperous people” looking at Fords – as: “Suits as street clothing” which would be un-common in Southern California, (especially during the Great Depression , The NRA (sign in Window) being established by FDR, which included the C.C.C. Org. part of the N.R.A.. The huge Fire Break in the San Gabriel Mountain Range background, “looks fresh”, so It easily could have been a CCC Project, manually cleared , —with shovels & brush hooks. (Not a road), the necessity for its width is: because of 100+ MPH “Santa Ana” Winter Winds coming down, over the mountains that can devastate the lower areas. Angeles Crest Crest Highway, beginning in nearby La Canada, (use a tilde “~” over the “n”), ascends to 4,500 feet for the right turn to Mount Wilson Road, at “Red Box”. Note the elegant Colorado Blvd street lamps , similar to those on Wilshire Blvd, In L.A. . Not ALL of the folks “going out West were “totally poverty stricken”! The NRA had lots of young folks to hire, for work , get fed, and send money home , through through orgs like the C.C.C. . Edwin W.